Is your Dog a Reactive Dog? A “Reactive” Dog, will show signs of aggressive or anxious behaviour towards another dog, by growling, barking, snarling or lunging at them. It can be a response to being afraid of coming into contact with a dog they have never met before, or a frustration of being on a lead and not able to greet the other canine. They may also react noisily and fearfully towards any passing cars, cyclists and joggers that you encounter on your daily walks. Some dog owners will resort to extreme measures to avoid the subject that triggers the reaction, by walking in the very early hours of the morning, or late at night, which isn’t very enjoyable for either them or their pet. Your dog may be a happy pet when he is at home, yet the moment you step out into the street he turns into some noisy, snarly beast. 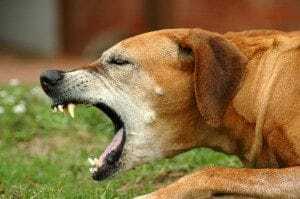 When he encounters a fearful situation, or another dog in his environment, rather than evaluate the situation calmly and act normally, he will panic and begin to bark and show his teeth. It’s not that your dog has a plan to fight every dog he encounters, or to frighten the neighbours. He really wants the scary object that is coming towards him to disappear, and the only thing that appears to work is to jump around and bark. Your dog isn’t vicious, nasty or aggressive, but is just afraid. The best way forward is to show him another route to reach the same results, without panic, distress or anxiety. Owners of reactive dogs tend to feel anxious, and sometimes unsure as to how best to handle the situation when their dog begins to react when outside, not to mention the worry about the looks they sometimes receive from passers-by, who wonder why they cannot keep their noisy dog under better control. Of course, as a pet owner, you are liable for your dog when out walking, and if it happens that you cannot control your pooch, maybe it’s best to seek professional help from a dog trainer or dog behaviour therapist. Lay the groundwork – make sure that your dog understands basic commands, and that he learns to trust you, his master. Don’t reprimand – when you know that a reactive situation is about to take place, divert your dog’s attention and get him to look directly at you, then reward him for doing so. Not all tricks to keep your dog relaxed and calm when on a walk will work with every dog, so it’s important that you find how best to calm him and keep him from becoming anxious. It’s a long process to desensitise your pet against these situations, but persevere and gradually train him to walk without incident. If you feel you cannot cope alone with your reactive dog, maybe now is the time to consider professional help. Aggression in dogs is a very serious problem that left unchecked can lead to further unpredictable and sometimes dangerous situations. Finchley Dog Walker can help with walking your dog and training him with positive reinforcement routines. Trained to recognise fear in dogs, and to provide very controlled walks, we cannot promise to perform miracles and “cure” your dog of his anxieties, but we can certainly teach your pet how to be less reactive when on the lead.